Like most people, my first exposure to the Latin Heart was in 1990 when I read Bob Ward’s book Ripples of Lost Echoes and saw the drawings there showing both sides of the Latin Heart. This piece is the most important of all the stones in the Peralta Stone Map set and is the only stone in the set that provides specific information pertaining to the location of the mines or caches depicted on the others. On the front side of the Latin Heart is an arrangement of Latin words. Unfortunately, due to wear on that side, the person who drew the paper copy was unable to make out three words, instead drawing empty boxes in these three locations. My research determined that the Latin words on the Heart which can be read, are written in what is referred to as “ancient” Latin, a form of Latin which in some cases is significantly different from modern Latin. 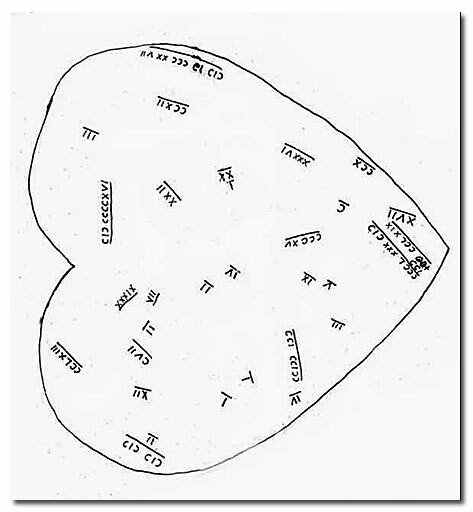 Although the back of the heart is covered with symbols that appear to be Roman numerals, as Bob Ward suggested in his book, I was constantly being told by people in the field of mathematics that they could not be Roman numerals because Roman numerals do not use symbols like (((((( and ))))))) nor is any symbol repeated more than three times. Well, through persistence and the wonders of the internet, a friend of mine, Louis Smith of Alpine, Arizona, was able to provide the answer to the meaning of the symbols. The symbols turned out to be, like the Latin words, a form of “ancient” Roman numerals that are different from the Roman numeral system in use today. Translations of the Latin words and Roman Numerals are given in the tables below. I never gave much thought to the Latin Heart until the day I saw a copy of it on Al Reser’s dinning room table. I asked Al about it, and he began telling me the history of the Latin Heart as he knew it. He told me he had learned from Charlie Miller exactly where Tumlinson had found the stone maps and that several other people also knew about that location. 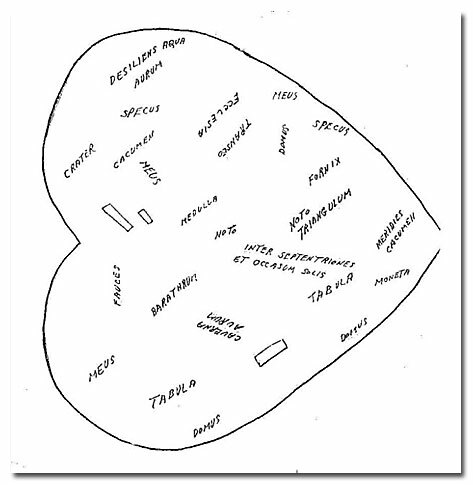 According to Al, one of them went back to the spot years after Tumlinson gave up on finding any more stone map pieces, and that person, being a little more persistent and searching a wider area than Tumlinson had, found the Latin Heart lying right on top of the ground. Al may have mentioned his name, or maybe not, if he did I can no longer recall it. Al never saw the Latin Heart stone himself, but he told me that a wrangler by the name of Bill Hinton or Hidden (my memory is not clear), who also had known Charlie Miller, knew the whole story about the Latin Heart, had seen the original many times, and could verify everything Al said. After hearing Al’s story I developed a sincere interest in the Latin Heart, but no matter how hard I tried I could never get Al to allow me to make a copy of his copy of it. Out of frustration, I finally said to Al that I didn't need his copy because there was one in Bob Ward’s book. Al grinned and made a remark that suggested his copy was in some way different from the one in Ward’s book. For months I tried to locate someone else who had a copy of the heart other than the one in Ward’s book. Then one afternoon I received a phone call from Tom Kollenborn, a local well-known historian and author, who knew I was searching for a copy of the Latin Heart other than the one that was in Bob Ward’s book. During the conversation he announced that he had located a copy, which was in the possession of a friend, whom he did not name, but said was currently living in Texas. Within three days Tom presented me with the copies of the Latin Heart shown above. The way to solve the mystery of the Peralta stone maps is to follow the directions engraved right on them, “BUSCA EL MAPA,” Study the Maps, and then follow them to where you think they lead. When you have arrived at what you believe to be the end of the trail, you remove the original Heart insert from the cavity in the top Trail Map and insert the Latin Heart into the cavity (This explains why the Heart Cavity was cut out in the upper Trail Map and the original Heart is removable. “BUSCA EL CORAZON,” Study the “Latin Heart”. If you find the landmarks specified on the Latin Heart in the vicinity around you, YOU ARE AT THE END OF THE TRAIL! The only thing left to do is to locate the points identified as “MEUS” on the Latin Heart. One of them is most likely going to have a number of the landmarks around it that Lost Dutchman Mine hunters have been searching for since the ‘Ole Dutchman died in 1891, and will validate the link between the Peralta stone maps and the Lost Dutchman Mine. On March 10, 1983, Michael Bilbrey, then 32 years old and already a thirteen-year veteran in the search for the Lost Dutchman Mine, filed a mining claim, LD8, in an area where he believed that the Peralta stone maps led. In an article in on Tuesday, February 1, 1983, Charles Kelly reported that Bilbrey stated he had assay reports on samples taken from his claim that showed a gold content in sufficient quantity to validate the filing of a mining claim. In the same article, Larry Soehlig, a Lands and Mineral Officer for the Tonto National Forest, is quoted as saying, “Based on what Mr. Bilbrey’s proposed he’d like to do, there’s probably enough (gold) there to let him continue with that little (mining) process.” Michael Bilbrey did find gold there. This gold, however, was not the driving force behind Michael’s many future trips to that remote and lonely location, among towering cliffs and deep valleys. Bilbrey had ended up there after following his own personal interpretation of the Peralta stone maps. He was constantly on the lookout for anything that looked out of place in the natural environment or which might suggest that “man”, that is, the Peraltas or Jacob Waltz (The Dutchman), had been there before him. During one of his trips to the mining claims, Michael accidentally discovered two stone crosses, each approximately 12 inches high, 6 inches wide, and a little more than 1 inch thick, partially buried in the loose gravel that covered the side of the slope near where he had been working. Both Stone Crosses had engravings on one side and nothing on the other. The second cross has a map-like orientation of symbols on it, similar to the symbols carved on the Peralta stone maps and consistent with the landmarks named on the front side of the Latin Heart. 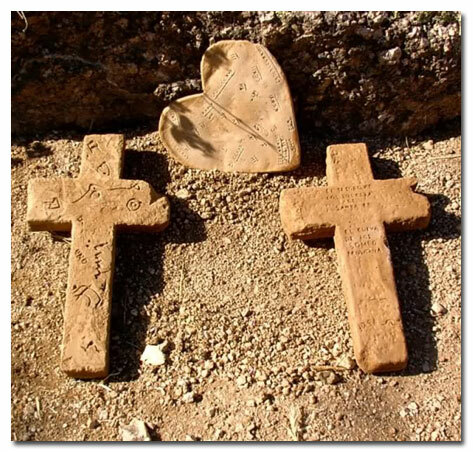 It is doubtful that Michael was aware of the Latin Heart at that time, but he could not have missed the similarities between the symbols on the Stone Crosses and the Peralta stone maps. Soon after making this discovery he appears to have lost all interest in his mining claims, and redirected his efforts towards understanding the stone crosses and searching for the Treasure of the Church of Santa Fe. Michael could not prove the story of his discovery of the Stone Crosses, and very few people outside his immediate group of friends believed him. Michael endured one of the most unpleasant set of circumstances a treasure hunter can experience. He had found the Stone Crosses at a time when he was alone in the mountains. This event took place, which of course could not be repeated in front of witnesses. A single witness to the event, or even a dozen, may not have been of any help in correctly interrupting the inscriptions on the crosses, but at least Michael would have had someone he could share the frustration with when he later was accused of fabricating the crosses. These accusations reverberate around campfires and dining room tables to this day. Eventually when their combined efforts produced no treasure, even his friends began to doubt him and lost interest in the crosses and the alleged treasure they hinted at. Michael was the only person left on the planet who knew for certain that he had not fabricated the crosses, so he continued the search for the Treasure of the Church of Santa Fe alone. According to people who knew Michael he remained a dedicated searcher for many years. He even relocated from San Diego, California to Scottsdale, Arizona to be closer to the Superstition Mountains so he could dedicate more time to his search. There is nothing in recorded history, legend or lore, to indicate that Michael ever found the treasure which he never stopped believing was out there somewhere. I believe that the Stone Crosses are authentic relics which do apply to a buried treasure of some kind, so I can only assume that Michael’s failure to locate it was due to an assumption that the treasure was located somewhere in the immediate area where he found the crosses. He may never have given enough consideration to the idea that the stone crosses may have been dropped where he found them accidentally by someone (or something) just passing through the area. As the story goes, the Peraltas had their mules loaded with all they could carry, which would have included the stone maps, and were attempting to get out of the mountains when they were attacked by Apaches in great numbers. Here's how I think events occurred. During the chaos of the battle the mule carrying the stone maps (including the Stone Crosses and Latin Heart) made up his mind that it was every man and mule for himself. The mule set out on his own towards the only way he knew out of the mountains, which had to be the way the party had come in, directly south towards Florence Junction. Meanwhile, the Peraltas fought their way toward the open desert using a shorter path they knew about, which ultimately brought them to the western slope of the main Superstition Mountain, where legend says the battle ended in the Peralta’s defeat by the Apaches. The mule loaded with the stone maps could have escaped the battle and passed through the area where Bilbrey found the Stone Crosses. The crosses may have fallen there from the packs and settled into the loose gravel, then lay undisturbed until Bilbrey found them in the early 1980’s, more than 100 years later. The mule could have continued on, heading south with the remaining pieces of the stone maps still on his back, making it all the way to Florence Junction before the rest of the maps started breaking loose from the packs. The Latin Heart fell first by itself, and the remaining stones fell together where Tumlinson found them in the late 1940’s. It is true that Tumlinson said that he dug the maps out of the ground, but anyone that has lived in the desert, knows that heavy objects left lying on the ground will sink into it when the rains soften the ground. If they lay there through 100 years of monsoon rains, I would expect them to be at least partially submerged. This is consistent with Michael Bilbrey’s story about having to dig the Stone Crosses out of the ground where they had settled. Had the Stone Crosses, the Latin Heart, the Priest/Horse Map, the two Trail Maps, and the first Stone Heart all been found in the same place at the same time, someone might have been able to evaluate them as a complete set, determine the correct way to make use of them and locate the mines or treasure they pertain to long before now. We have started an new forum for posting replies to this article. You can post pictures and edit your posts; it is easy for you to use. To post to or see posts on the Lost Dutchman mine you need to register for the forum, it is free. View our Gold Prospecting & Treasure Hunting Forum. There are over 280 pages of information. Read about the discovery of the Peralta Stones. All photographs used in this article are of full-scale museum quality reproductions of the Peralta stone maps, Stone Crosses and Latin Heart. Special Thanks to Doug Stewart who maintains a website at: http://www.lost- dutchman.com for his much appreciated consultation in the preparation of this work. Copyright © 2005-2012 by Jim D. Hatt All Rights reserved, No part of this document may be reproduced or copied in any form or by any means graphic, electronic or mechanical, including photocopying, recording, taping, or retrieval systems without the written permission of Jim D. Hatt. There is a section for posting replies to this and other articles.